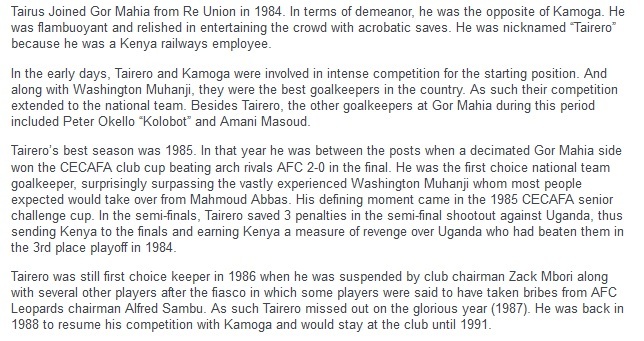 With skipper Jerim Onyango having finally decided to hung his gloves and his boots, its time to take a trip down memory lane to remember the best players ever to man the posts for Gor Mahia Kogalo. Gor Mahia goalkeeper Boniface Oluoch has recently announced that it was he who opted out of the match against Chemelil Sugar. 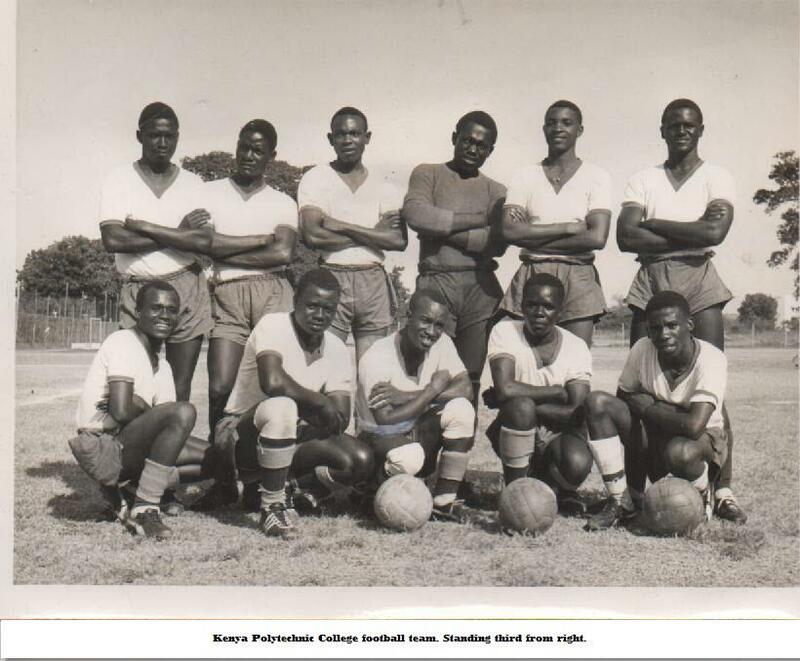 There were some reports that he was left out of the team as a disciplinary measure due to his scuffle with coach Frank Nuttall. A report by goal.com suggests that Oluoch asked to be left out. 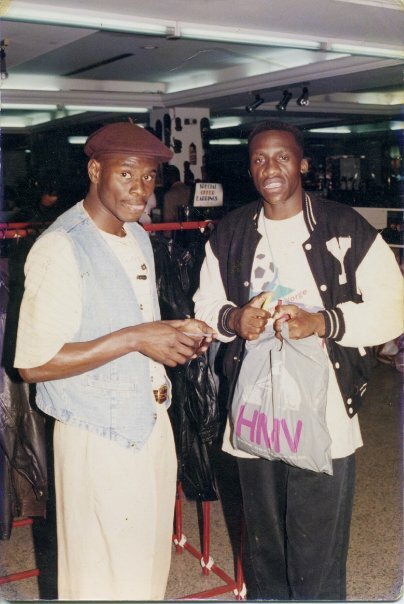 Oluoch was also fearing for his life. Perhaps these threats could have been avoided if the coach was empowered to hand out his own disciplinary measures. Since there are no disciplinary measures, some irate fans have taken it upon themselves to met out discipline and threats. At Gor Mahia recently a number of players besides Oluoch have fallen below the threshold required for professionalism: Some disappeared for almost two months. Several others came back late for pre-season training. Two others were engaged in a scuffle at the Mombasa aiport. The Kenyan scene is a stark contrast to the scene in the English premier league where managers are empowered to met out disciplinary measures for the slightest of offences. Below is Arsene Wengers disciplinary sheet courtesy of the Daily mail. This sets expectations among players and enforces a level of professionalism. It would be interesting to find out if Kogallo players still receive their full salaries for the month of January even if they missed half or all of it. It is a stark contrast to previous years when chairmen like Zack Mbori suspended players for months and even years for indiscipline while coaches like Len Julians read the riot act to players for on the field incidents. Harambee Stars face a tall order when they take on Cape Verde on Friday. Firstly they will be playing against a side that is ranked number 32 in the FIFA rankings which is fourth in Africa. It is a starke contrast to Kenya who are ranked number 125 in the FIFA rankings. They are coached by Rui Aguas, a vastly experienced coach who also was the top scorer in the European champions cup in 1988. The Cape Verde team is composed entirely of Europe based players. harambee stars preparations are usually bad but this time they have been especially bad. Both FKF and the Ministry of sports declined to provide any support for the national team with each party pointing fingers at the other. At one point the team did not even have a field to train in. The lack of support lowered the morale of the players many of whom showed up late. The players have expressed dissapointment that despite pleading for proper preparations and friendlies, their pleas have fallen on deaf ears. “As usual the preparations have not been that good. It’s just up to the players to motivate themselves because we know the problems we are going through. We will give our best. Preparations are not always perfect but we are trying hard to work with what we have. Let fans come in large numbers and support us,” said Wanyama. Nevertheless former Gor Mahia coach Bobby Williamson who now handles Harambee Stars was upbeat. “We are still waiting to see if our players such as Mandela,Origi, Keli will arrive in time for the game but the delay kind of worries me as most of them are part of our plans for the game. We will also dearly miss the services of Ayub Timbe who has been ruled out with injury. As a coach I am optimistic of good results and it is an opportunity to give our best in the prevailing circumstances while hoping for the best,” Williamson told supersport.com. Foreign based players that have arrived in camp include are skipper Victor Wanyama of Southampton, Johana Omollo of Royal Antwerp, Allan Wanga of Azam Christian Bwamy of Follo in Norway and the former Gor Mahia duo of David Owino now at Zesco, and Teddy Akumu now at Al Khartoum. Among the players who are likely to feature are Gor Mahia goalkeeper Boniface Oluoch who is sure to start between the posts given the absence of Kenya one Arnold Origi. Oluoch had a shakey performance against Congo in Brazzaville but his performance between the posts has shown steady improvement. 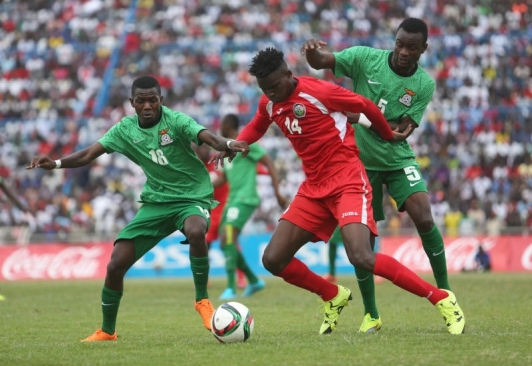 Spearheading the Kenya attack will be Gor Mahia striker Michael Olunga. His performances for the national team has been stellar. 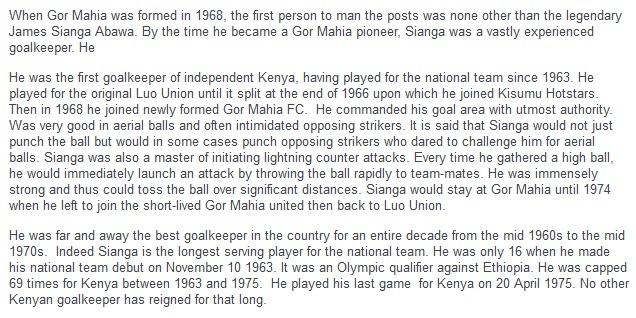 He was on target when Kenya played Zambia at Nyayo during which he was one of the few bright spots on the team. 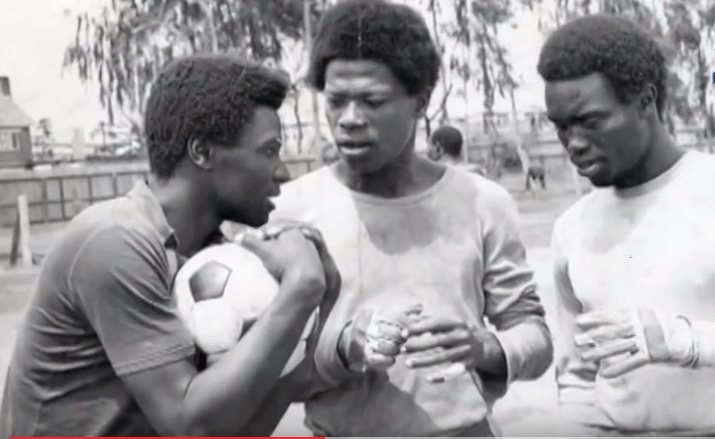 Against Zambia, the national team was plagued by indiscipline before the match, culminating in the suspension of players like Danson Kago and Jesse Were, both of Tusker. At the time FKF chairman Sam Nyamweya vowed to met out lengthy suspensions. But coach Williamson has now recalled the duo. The last time these two sides met was in 2003, Kenya won both home and away legs 1-0 and went on to qualify for the 2004 Africa Nations cup. On that occasion, Dennis Oliech scored the crucial goal at in the last match at Kasarani and was carried shoulder high by jubilant fans. This time things will likely be different. Kickoff is on Friday November-13-2015 at 4pm. The venue is Nyayo national stadium. Michael Olunga bagged the scoring title at the recently concluded CECAFA club cup. He scored 5 goals. Olunga also received the most plaudits of any player at this tournament for his clinical finishing, his precise assists and ability to take on defenders. His dexterity with the ball at his feet is excellent for a player his height. Other top scorers were: Saleh Eldin Osman Bilal (Khartoum National) and Kipre Chetche (Azam), who scored four goals each. 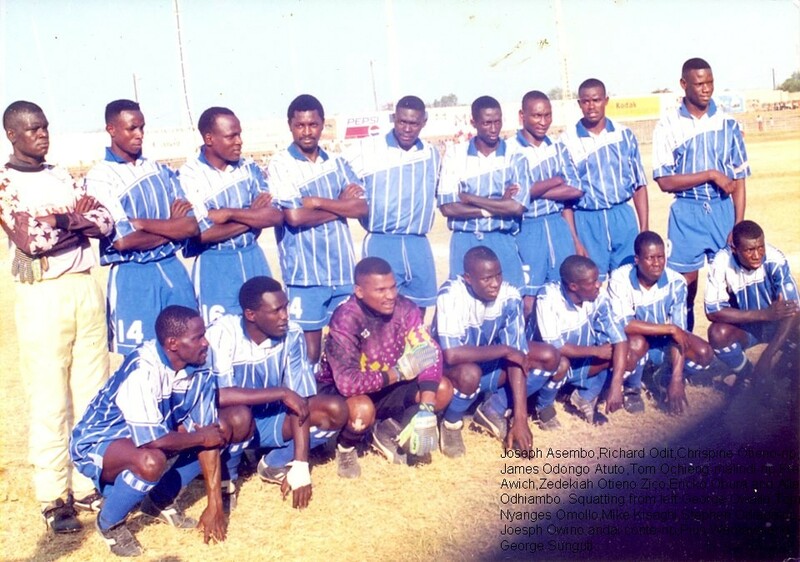 Malimi Busungu (Yanga) and John Bocco (Azam) scored three goals each. 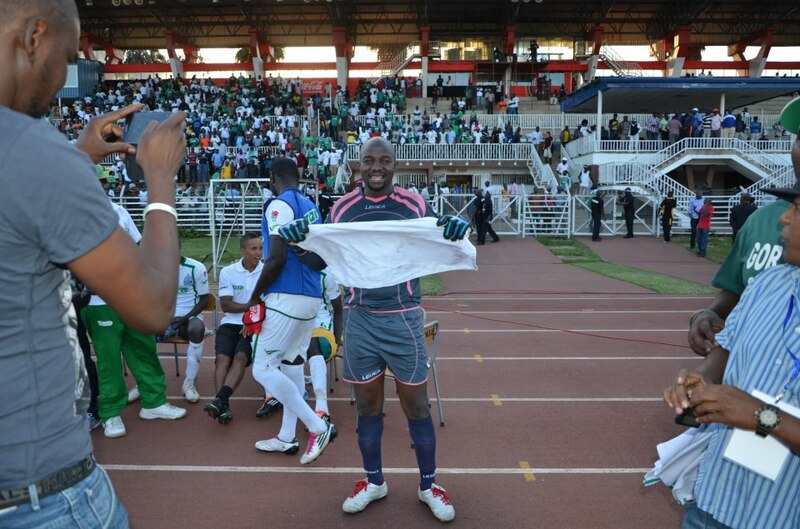 Goalkeeper Boniface Oluoch was named as the best goalkeeper of the tournament. 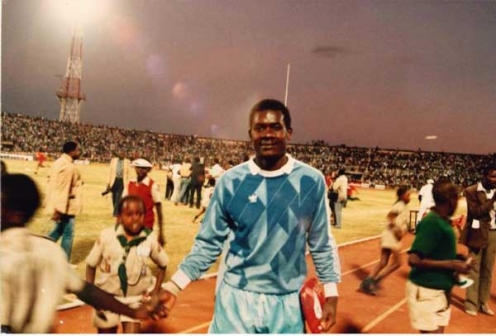 Oluoch has already established himself as the best keeper on the local scene. Adding a regional title is another feather in his cap. Ivory Coast defender Serge Pascal Wawa Sfondo was named defender of the tournament and also player of the tournament. Despite playing with a 3 man defence, Azam did not concede a goal throughout. Olunga though happy with his award, was unhappy at the final result. “Individual rewards are good like the golden boot but I feel it would have been fantastic to be on the winners’ podium as a team. We have to now go back and concentrate on the league,” Olunga told supersport.com. 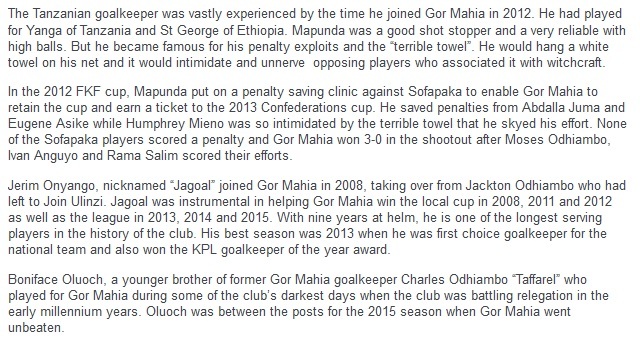 Gor Mahia have a lot to be proud about. It is a vast improvement on their performance from last season. The home team (in this case Azam) is always favoured to win. And No Kenyan team has come close to winning this tournament since Tusker won it over 5 years ago. 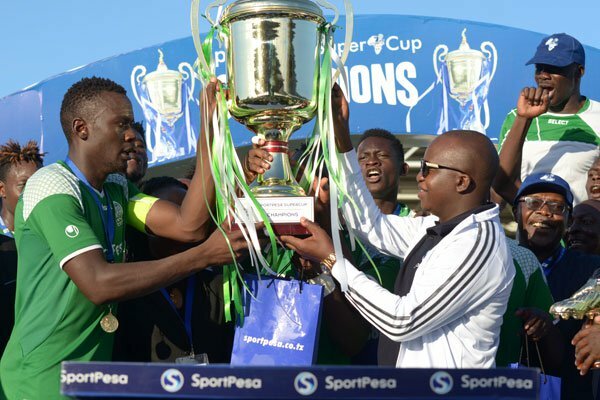 Gor Mahia can build on this success to challenge for honors in 2016. As Gor Mahia shift focus to City Stars, coach Frank Nuttall will be using the draw against arch rivals AFC leopards to push his side to work harder. Nuttall lauded his side and thinks they deserved the win . One area where the team will need to work harder or restrategize is in the defensive section. Thus far the Gor Mahia attack is sharper than it has been since the Steve Okumu, Dan Ogada, Steve Odiaga era of the late 1990s. In the past few years, though Gor Mahia did not score much, they scarcely conceded goals. Defense is one area the team will need to study. Gor Mahia has conceded a goal in almost every game. It must be said however that at least two of those goals were from direct free-kicks. In past years, Gor Mahia deployed two defensive midfielders. Now Gor Mahia deploys only one (usually Gattuso) and he at times appears overburdened. Nevertheless the full time return of Dirkir Glay who is an experienced central defender will help shore up that section. 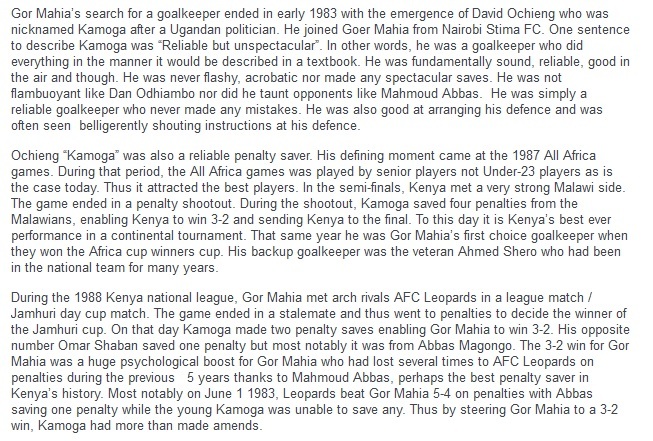 If Gor Mahia’s defence appears shaky, it certainly cannot be blamed on Boniface Oluoch’s shot saving exploits. Oluoch who joined from Tusker has been in fine form this season making crucial save after crucial save. None other than the national team coach Bobby Williamson has lauded Oluoch. Boniface had an opportunity to learn the art of goalkeeping from close quarters. 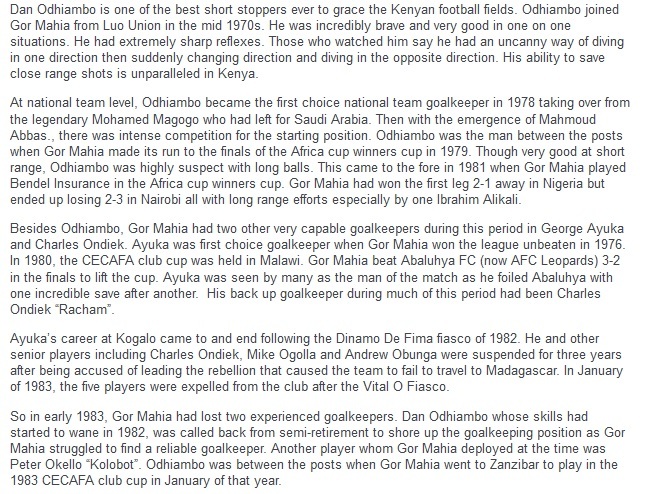 His brother was George Odhiambo “Taffarel” (RIP) who played for Gor Mahia in the late 1990s. “Taffarel” passed away in 2013. 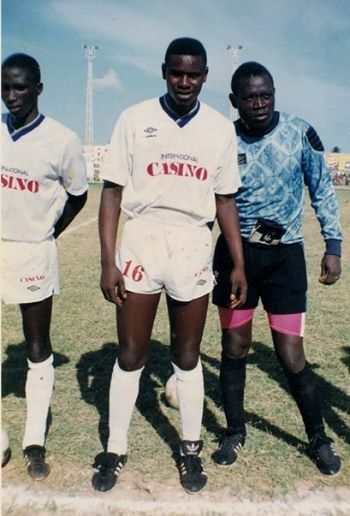 His other brother is former KPL referee Andrew Juma.